Jared Unzipped: Spinach Tofu Dip Recipe. Mix all of the ingredients except for the mozzarella cheese gradually in a food processor, beginning with the tofu. Then add the spinach. As the mixture is whipped together, add each successive ingredient. Mix until the consistency is as you would like it. Pour the mixture into a serving bowl and add the mozzarella cheese, stirring manually. Once the cheese is evenly distributed, it's ready to eat! 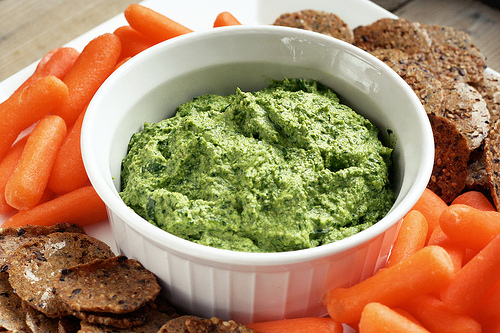 This dip is great for raw vegetables, crackers, fresh bread or even on meat (like fresh grilled chicken). Plus, it's health conscious and much better for you versus other traditional spinach dip recipes (they're full of sour cream and cream cheese). I promise you'll like it!